Spinal Tap’s Nigel Tufnel demonstrates his hifi speakers are louder because the numbers all go to 11. Scientific control knobs for climate change have to be used with more care. The ‘urban heat island’ arises because air temperatures measured in urban cities can be different to those of the rural city surroundings. Thermometers were and still are more often found in cities than surroundings. City temperatures have a synthetic, man-made component that needs to be subtracted to match the surrounding rural temperatures, which are the items of interest for climate studies. Failure to subtract the UHI effect will lead to false results for temperature trends such as those used to claim global warming. The question arises whether rural and urban temperatures have adequate accuracy to provide reasonable results after the subtraction. This essay argues that historic Australian rural temperature records are unfit for this purpose; that global temperature records are likely to be similarly inadequate; and that as a consequence, all past estimates of UHI derived from land surface temperatures by thermometry are invalid or questionable. In short, all past estimates of UHI magnitude before the satellite era are incorrect for reasons given. The actual rates of global temperature changes over the past century are likely to be wrong by a significant amount, of similar magnitude to the global warming claimed at about 1°C per century. More recent estimates are being made with temperatures from instruments on satellites, which help the future path to better understanding. On present knowledge, three dominant processes affect global surface air temperature estimates. 3. Measurement inaccuracy, including UHI. The relative proportions of these are not yet known. In particular, the uncertainty of estimated climate sensitivity to greenhouse gases is large and unchanged by 30 years of intensive research. The UHI effect has the capacity to be as large as the others, but its magnitude is again poorly understood. Here are excerpts from papers often cited in UHI references. “The paper demonstrates the relationship existing between the size of a village, town or city (as measured by its population), and the magnitude of the urban heat island it produces. This is accomplished by analyzing data gathered by automobile traverses in 10 settlements on the St. Lawrence Lowland, whose populations range from 1000 to 2 million inhabitants. The locations of these settlements effectively eliminate all non-urban climatic influences. The results are compared with previously published data. From M. Roth 2013 Handbook of Environmental Fluid Dynamics, Volume Two, Chapter 11, p. 143. The UHI is predominantly a night time phenomenon caused by differential cooling rates between urban and rural areas. From the energy balance study in 2004, results showed that there are large differences in evapotranspiration between urban and rural areas that lead to baseline differences in UHI intensity between the two environments because more energy is partitioned into atmospheric heating and heat storage – driving development of the UHI. A major concern about the accuracy of analyses of global temperature change has long been the fact that many of the stations are located in or near urban areas. Human‐made structures and energy sources can cause a substantial local warming that affects measurements in the urban environment. This local warming must be eliminated to obtain a valid measure of global climate change. Global temperature analyses now routinely either omit urban stations or adjust their long‐term trends to try to eliminate or minimize the urban effect. A comprehensive review of the topic is provided by Parker . These excerpts note sixteen factors involved in UHI. They are population density, fires, seasons, day or night, degree of city development, wind velocities, wind directions, cloud amounts, artificial surfaces, moisture, urban hydrology, storm water, soil properties, time of day of observation, anticyclones, evapotranspiration, weather station relocation. One customary method for treatment of data like these is a form of multivariate analysis such as multiple linear regression. Measured values of each factor are input to calculations showing the percent of the variability explained by each in a statistical sense. Historic data do not have this extent of metadata for most factors, so the method cannot be used. It does not seem to have been attempted with modern cities. By default, researchers have selected one or a few of the variables for study, often for a very small number of cities. Some have derived relationships, such as UHI with population by its 4th root, by Oke, 1967. These studies are of limited use because of the lack of treatment of other variables. None of the cited papers has any serious attempt at estimation of uncertainty of results. The present situation is one of large, continuing lack of research attention. There is not even a detailed description of how large the UHI effect is, using a representative set of city examples, let alone its uncertainty. This is an intolerable situation because of the possibility of the magnitude being similar to, even greater than, natural variability and greenhouse gas effects. Melbourne, as well as Australia in general, has been the locus of many publications about Urban Heat Island effects. The references in this paper by Morris and Simmonds of the University of Melbourne show some of the scope of research until 2000. There is abundant evidence that UHI exists. It is beyond reasonable doubt. UHI has had much discussion because it changes the temperatures within cities compared those of the city surroundings and the large unsettled areas beyond. Many weather station sites are within cities. Their thermometers are assumed to be contributing a non-climate effect to the climatic temperature record of the surrounding areas for which a temperature is sought. The UHI effect needs to be quantified and subtracted from the record, station by station, if one is to avoid synthetic heat contamination. (Start of quote). 14. How does the urban heat island effect impact the climate data? The urban heat island effect can increase surface air temperature at urban locations. While studies have found the effect has minimal impact on global long-term temperature trends, urban sites are not included in the Bureau’s assessments of temperature trends across Australia. (End of quote). That presumes that the BOM has a workable method to distinguish urban from rural sites. For reasons like this and others, many estimates of UHI are plausibly inaccurate and difficult to put into proper context, but annualized UHI estimates are in the same range of up to 1° C as the century of alleged global warming for Australia. This would mean that the whole of the BOM warming estimate could be caused by errors in UHI correction methodology, if used. An error of this magnitude, if proven, would have a significant effect on national policies to deal with global warming. 1. The BOM has created and maintained a historic temperature record of commendable quality. It is a major part of instrumental reconstructions of the climate history of the Southern Hemisphere since roughly the 1880s. 2. Australia is a large country with an area of some 7.7 million km², similar to that of the contiguous USA. This allows testing of UHI effects under a variety of natural climates. 3. The population of Australia is about 25 million, with most grouped into the 6 main capital cities, including Melbourne (5 million). Opportunities exist to study weather stations both close to and remote from human influence. 4. Since about 1800, there has been one dominant language, English, plus one dominant heritage for the conduct of science and cultural news, again English. Therefore, historic records are consistent with each other compared (say) to a similar area of Europe, where even a simple concept like Brexit becomes complicated. 5. Until about year 2000, the study of Australian climate was largely by clean science. As global warming advocacy became widespread, the standard of overall science fell away. However, the raw records to 2000 appear to have been kept pure. Here, I use only raw records from the BOM. 6. Australians were among the earliest involved in UHI research. EARLY AUSTRALIAN WORK ON UHI. UHI is seldom the primary target in early temperature/climate papers, which tend to stress temperature measurement uncertainties. See for example, this 1996 work from the Ph.D. thesis of Simon Torok. Around late 2004, a geologist colleague, Warwick Hughes, received an email from Professor Phil Jones of University of East Anglia, an email that has had numerous subsequent citations. This quote is both a lead-in to the history of UHI in Australia and my involvement in it. You are encouraged to read the 12-page essay that I wrote about it, because it is now part of the relevant history of global warming including UHI – and it releases me from repeating myself here. In essence, Prof Jones selected 25 “Regional and Remote” weather stations in Australia that he seems to have thought would be free of UHI. He compared their historic temperature averages with those of 6 capital cities. By subtraction, he found that UHI was negligible. Warwick Hughes asserted that the 25 control stations did have their own significant UHI and that the subtraction of temperature averages done by Jones was misguided through wrong assumptions. Jones, at the same time, found negligible effects in China and other places. These are 2 of the key papers by Jones et al. P. D. Jones, S. C. B. Raper, R. S. Bradley, H. F. Diaz, P. M. Kellyo, and T. M. L. Wigley,1986. Northern Hemisphere. P. D. Jones, S. C. B. Raper, and T. M. L. Wigley, 1986 (Does not mention Australia).Southern Hemisphere. Hughes tried to get opposing views published, but was met with opposition. Some work was published, but not in a high-impact journal. In these early years there was a BOM draft Paper, M.J. Coughlan, R. Tapp and W.R. Kininmonth; 1990, “Trends in Australian Temperature Records” by three senior BoM staff. They calculated UHI magnitudes by various comparisons between central city sites in the Australian state capitals and their respective airports. The BoM found substantial urban warming, greater than the scale of global warming. Here are some numbers and passages from their paper, slightly modified for smaller format. (Start of quote) 6. Summary and Conclusions. Trends which have occurred in urban-rural differences of maximum and minimum temperature at each of six large Australian coastal cities over the past 25 to 45 years indicate that temperatures at the urban sites are being affected by …….. (copy unclear) in their vicinity. These trends were least at the smallest of the cities examined in this study, Hobart. A limited examination revealed no consistent variations of HII by season which were common to all cities which necessarily remained constant in time at individual cities. Table 2: Estimated linear trends (C decade¯¹) in the difference between annual average temperatures at urban sites relative to adjacent non-urban or outer urban sites in Australia. Trends are for the total period of available data. The most rapid minima increase, of approximately +0.4 C decade¯¹ was recorded at Sydney. The relationships between city size and HII for maxima were much weaker. Overall trends in the urban-rural differences in maxima ranged between approximately +0.29 C decade¯¹ at Brisbane and -0.16 C decade¯¹ at Melbourne. (End of quote). The emphasis here on the BOM draft by Coughlan eta al. is deliberate. In 1990, this BOM finding suggested that UHI was a strong factor, one for detailed further examination. The work of Jones et al. in the 1980-2000 era, referenced above, was to the contrary. The Establishment science community backed the Jones interpretation, based as it was on unsuitable data. After, there was a concerted effort globally to try to stuff the UHI problem under the table, to say in public that it was tiny, to represent anthropogenic global warming as 1°C over the century studied, when more accurately it could well be less than half of that. Around 2010, the UHI literature was simply confusing. There were many papers treating UHI correction as a fait accompli. Most relied on customary subtraction of rural temperatures from nearby city temperatures. Many were deficient in their treatment of error estimates. About May 2007 I started to work on ‘pristine’ Australian sites. This was prompted by Steven Mosher who was associated with the Berkeley team that has produced the global BEST temperature data set. Mosher had sent me a spreadsheet with his choice of about 157 Australian stations that might be away from the hand of Man. About this time a disc crash on my PC obliterated both the primary Mosher spreadsheet and my detailed response to it. Mosher advises that his set was also lost. An intermediate spread sheet is still on my files, but it does not have much value. In February 2015 I produced the 44 station ‘pristine’ spreadsheet of Australian sites, with temperature records from 1972 to 2006 included (35 years). Metrication from F to C started in 1972; and the BOM data available to me in easy form ended in March, 2007, thus setting the end years of the study. This is the spreadsheet that matters for this essay. The simple analysis was done by fitting a linear time regression through the annual averages of both Tmax and Tmin. The slope of the line was converted, for ease of comparison with other papers, to the change in temperature per century. This is a conventional form of analysis that I dislike for a number of reasons, but many other people were doing it, so I used it for compatibility. The 2 graphs below are of one site chosen from the 44 to show the representation method. These two graphs show temperature trends of -1.5 C for Tmax and -0.9 C for Tmin, so these are examples of urban cooling if the data are accurate. Overall, 6 of the 44 examined stations have cooling Tmax trends and 14 out of 44 have cooling Tmin trends. This is difficult to interpret in terms of UHI effects. One must assume that there are no UHI influences at work, but the variability of temperature trends is high, from station to station. DISCUSSION ABOUT THE SPREADSHEET THAT MATTERS. 1. The dominant conclusion is that the historic temperature data as available are not fit for the purpose. Weather stations were designed and sited for purposes quite different to the demands now placed on them to correct for UHI. 2. Consequently, there is little point in taking analysis any further. 3. It follows that historic data from other countries, which can be assumed to be broadly similar to Australia’s are also unfit for the purpose of researching or correcting the Urban Heat Island effect. 4. The primary concern is that the signal:noise ratio of ‘pristine’ sites is too small. Maybe, quality decreases with absence of the hand of Man for maintenance and quality control. 5. While one can fit a regression to show the change of temperature with time, here named the slope – and one can chart the slope versus other variables such as latitude and altitude, the high noise level prevents a useful analysis. This is shown in a comical way by use of the World Meteorological Organization numbers of the weather stations, which show a distinct trend with the slopes at the 44 stations. I know of no theory to predict this correlation. It is highly likely to be due to noise and if so, it must be nonsensical. 6. Therefore the remainder of the graphs should to be treated as nonsensical. 7. Other papers such as Oke, 1967 and Parker, 2010 (refs. cit. )have obtained a correlation of UHI magnitude with surrounding population numbers, then others like GISS (ref.cit.) have included this observation into their adjustment schemes. An interesting question is, should the WMO number also be included in adjustment schemes for Australia? SEVERITY OF THE UHI EFFECT. (Start quote) The Urban Heat Island (UHI) effect describes the observation that temperatures in a city are often higher than in its rural surroundings … A well-known example is Tokyo where the temperature has risen much more rapidly in the city than in nearby rural areas: Fujibe estimates excess warming of almost 2°C/100yr compared to the rest of Japan. The warming of Tokyo is dramatic when compared to a global average as seen in Figure 1. From the satellite based work of Youn-Young Choi et al. there are time-of-day effects that make Seoul, Korea seem some 8°C hotter than its surroundings and Tokyo about 10°C hotter, as the largest of the observed effects. On the diagram, different hours of the day are in different line colours, witrh hours 1200 and 1300 showing the greatest heating. To my knowledge, no routine scheme for correcting UHI copes with corrections of this magnitude. There is a real UHI effect. It is large enough in some cases studied to influence century-long estimates of global warming. There is no current way to estimate the global consequences of the UHI effect. There is a small but finite probability that most global warming estimates were mainly estimates of UHI effects. in the numbered block starting “1. How far from a thermometer does a synthetic heat source have to be … “ One then realises that there is no possible answer to some of the questions. Even the simple question of where in the heat bubble the temperature was taken cannot now be answered because the conditions cannot be re-created. There is far from adequate detailed metadata. The major difference between Hausfather’s work and mine is that Hausfather makes assumptions that cannot be verified because critical parameters were never measured. Also, there are no tests to show that Hausfather’s ‘rural’ sites have historic data of adequate quality to allow their classification and use. They do not have adequate quality, in these Australian examples. It would be difficult to find sites anywhere that are more isolated from Man than these in Australia. When one graphs the temperature trend from annual data over time, the software is always going to find a line of best fit. That line can, in ideal cases, lead to the establishment of quantified causation. In these Australian examples, it does not. It is merely the mathematical line of best fit by the least squares method. 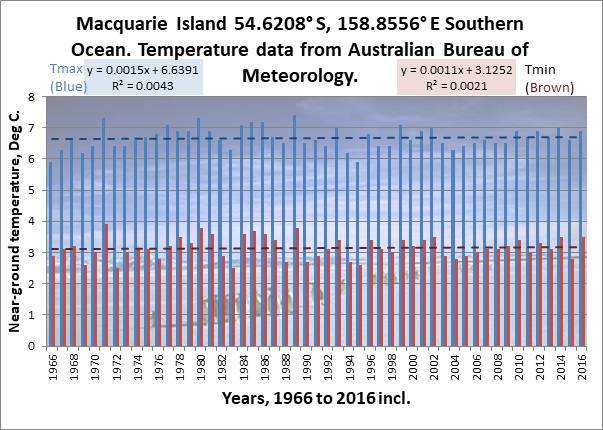 Scientific inquiry might better be directed towards explaining why Macquarie Island has such a low temperature trend, rather than selecting sites elsewhere with high temperature trends and subtracting from them using numbers that have a high guesswork component. SOME DETAILS OF CURRENT UHI ADJUSTMENT METHODOLOGY. The following extracts from the given references provide a guide to current thinking and practice. Hansen et al 2010 (the use of satellite nightlights). “ A major concern about the accuracy of analyses of global temperature change has long been the fact that many of the stations are located in or near urban areas. Human‐made structures and energy sources can cause a substantial local warming that affects measurements in the urban environment. This local warming must be eliminated to obtain a valid measure of global climate change. Global temperature analyses now routinely either omit urban stations or adjust their long‐term trends to try to eliminate or minimize the urban effect. A comprehensive review of the topic is provided by Parker . One of the improvements — introduced in 1998 — was the implementation of a method to address the problem of urban warming: The urban and peri-urban (i.e., other than rural) stations are adjusted so that their long-term trend matches that of the mean of neighboring rural stations. Urban stations without nearby rural stations are dropped. This preserves local short-term variability without affecting long term trends. Originally, the classification of stations was based on population size near that station; the current analysis uses satellite-observed night lights to determine which stations are located in urban and peri-urban areas. Readers are strongly encouraged to read the 1965 book “The Climate of London” by Tony Chandler referenced at the start of this essay. Between then and now there has been a change in the way that Science is done. Chandler’s work is observation, measurement, then deduction. He describes the construction of weather stations designed to start quantification of the spatio-temporal variables that affect London’s climate. After you read his book, you might conclude that this type of measurement work is lacking in modern times and that many problems would be solved if this approach had been executed at many city locations around the globe. Assumption science for UHI has produced a series of deceptions. How can scientists state that “The effect of this adjustment on global temperature change was found to be small, less than 0.1°C for the past century” as James Hansen et al. did in 2010, when this essay has examples of warming of city centres like Tokyo, Seoul and Beijing by 8 to 10°C? Can one believe that the present GISS adjustment for UHI copes with this? If it fails to cope with this, how much more is wrong before finally, the adjustment moves into examples which might be plausible? A UHI effect of ‘less than 1°C averaged globally’ is not the appropriate metric to express that all is well, though James Hansen maintained it was. Where are the uncertainty estimates? There can be no significant advancement in understanding of UHI until many more locations are either fitted out with ground instruments or studies with satellite temperatures, to see at least what the variation between sites is really like. All of the correction schemes to data rely on subtraction of rural from urban temperatures, but there is no proven way to distinguish between urban and rural. I have attempted to reinforce this missing factor by questioning whether existing data are accurate enough to even classify a site as urban or rural and I find that in Australia, the data are not accurate enough. Even the simple observation that in historic data, the precise past location of the thermometer relative to the (unknown shape and size of the) alleged heat bubble is enough to warn of the likelihood of very large errors. How can a scientist construct an ‘average’ rural site when there is a lack of historic information to do this, let alone accurate information? In conclusion, one has to admit that the present UHI correction procedures are ‘junk science’ – but with huge price tags attached for being wrong. Some have seen through the deceptions of assumption science – here is but one reference expressing disquiet.